Louise’s closet. Miraculously, she was able to accomplish this in eight weeks. We moved into our new apartment in Portland with our one suitcase each. Oh, the joy of empty shelves! Bathroom drawers eager to be organized! 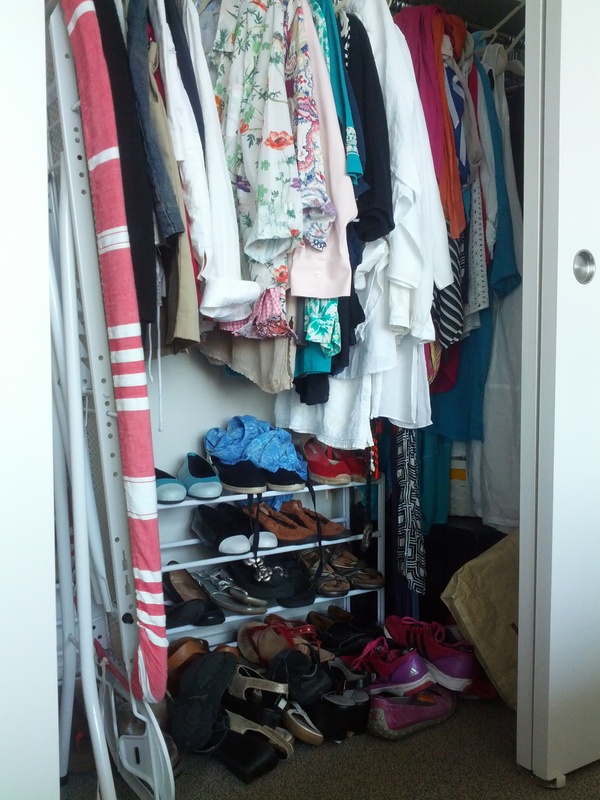 Closets with brand new matching empty hangers! It was bliss to be so unburdened, to lead a lightweight life. Tom’s “appliance garage” started it all. And then….. I hate to be a shrew, but Tom started it all by buying a humongous slow cooker and a deluxe stainless-steel rice cooker. 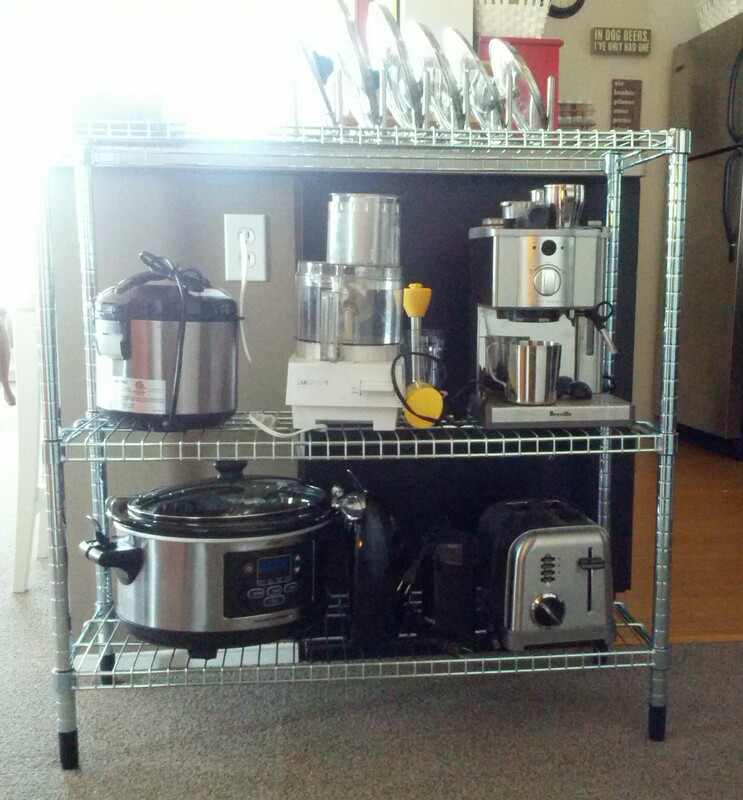 We brought in the toaster and food chopper from storage, and I added a hand mixer and an electric can opener. Then we needed a storage unit to keep them all in. Tom bought two vacuum cleaners, and since we suddenly had a rug, we needed both spot remover and general rug wash.
For me, it was the clothes sneaking in. As soon as the summer heat began, I found that my gauzy, baggy Mexican dresses, so perfect in the tropics, now limp from 98 washes each, looked frumpy in the city. I had to get shirts and dresses with the fabric finish still on. The four pairs of go-to sandals in beige and black that I had worn for twelve months were now grungy and worn. So yes, I needed urban wedge sandals in turquoise, lime and hot pink. I’d been deprived, after all! Beauty products snuck in. A new hair stylist recommended some products I brought home. The facialist was pushing tinted sunblock moisturizer. I bit. I hadn’t had new makeup in the year, so a trip to Nordstrom’s Chanel counter was required. (You do know that it’s downright dangerous to wear old eye makeup?) They give samples: end of uncluttered drawer. Teeth whitening strips were too frivolous for travel, but any day now, I’m going to use the ones I bought last month. Also those false eyelashes that were a total whim. Hey! I’ve got a washer and dryer at last! Enter laundry detergent, stain remover, bleach, fabric softener and spray starch. I made throw pillows and reupholstered cushions: now I have fabric scraps again. We had to buy a printer, and paper and cartridges for it. My shiny new white desk from West Elm demanded a matching set of white pens and scissors, plus a white tape dispenser. I won’t go on. You get it. Just fourteen months after the last tag sale, we’re getting ready for the next one. But I’ve got to admit it: necessary, guilt-free acquisition in the name of restocking is just about the most fun a shopping addict can have. Cute shoes in that closet! And the pink ones are still en route! I’m so proud of you for surviving a year WITHOUT all this clutter. except in Paris , where you can buy a shredded pair of jean at Christian Dior for $800 !! French women are so wonderful about that. They have four outfits and three dozen scarves and they always look wonderful! It would have been grand to have shopped with you. Just think you are going to need cold weather clothes and shoes and boots and cute hats, scarves, gloves, coats…..Many more hours of accumulation await you. Yes! I didn’t even think of that! FALL IS COMING!!! I remember my mother always said that seven moves equals one good fire. Well, I’ve exceeded that a couple of times over. Never heard that….it’s a good one! One NEEDS them, but only if one has a home with a closet. I suggest pack two very comfy neutral pairs and buy more along the way as needed! Making do is fun and so creative, but gee, to be able to relax, to have that rice cooker, those FUN shoes. Both avenues are equally good routes. An electric can opener and two vacuum cleaners? I think we have two; one for upstairs, one for down…for the cleaning lady. But we haven’t tried living out of a suit case. Good luck! More thoughts later on my experiences with the expatriate life.